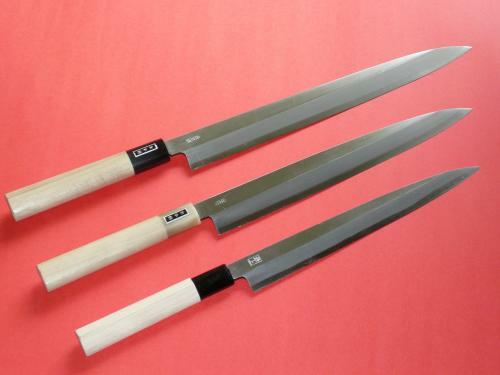 It is made by only the most experienced Sakai craftsmen. 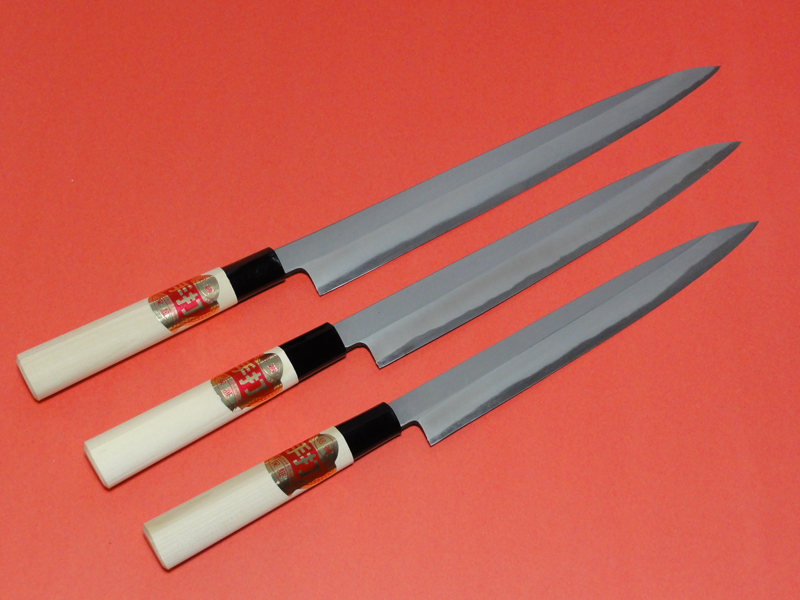 The blades are made form Yasuki White 1 steel considered to be the finest quality white steel from Yasuki steelworks. Handles are an octagonal shape made of luxurious ebony wood with a buffalo horn bolster and cap. 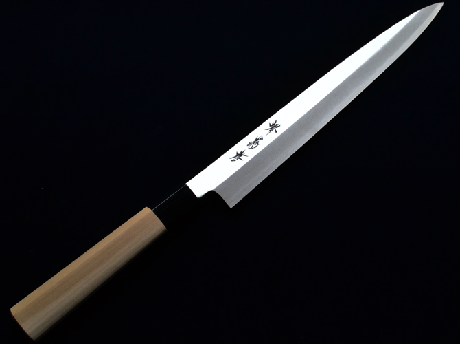 Each knife comes complete with a lacquered saya. 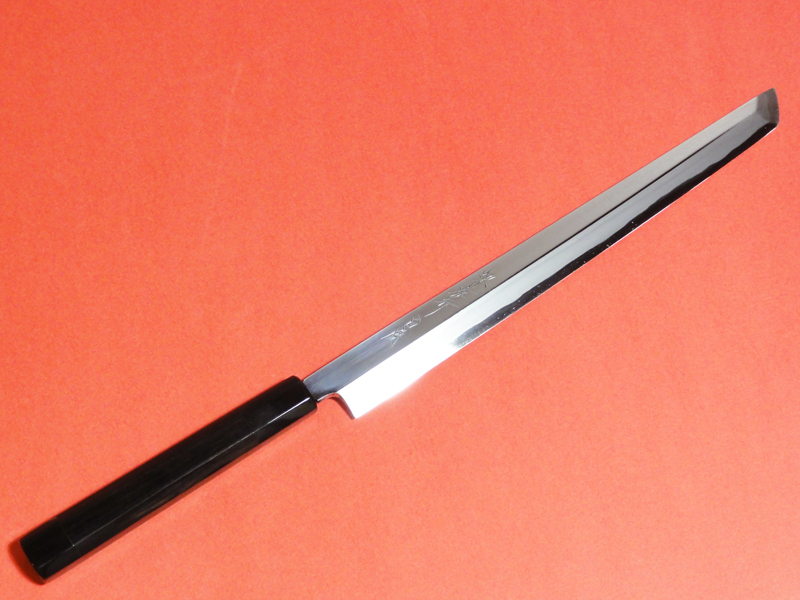 This sword tip knife is a modern twist on the takobiki paying homage to the swords of old with a katana inspired kissaki. 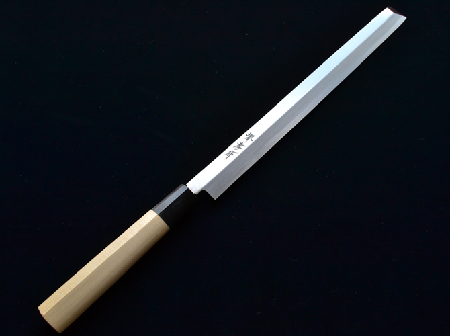 The blade is thinner than a yanagiba, almost like a fugubiki with a very slight sway in the back for silky smooth action. 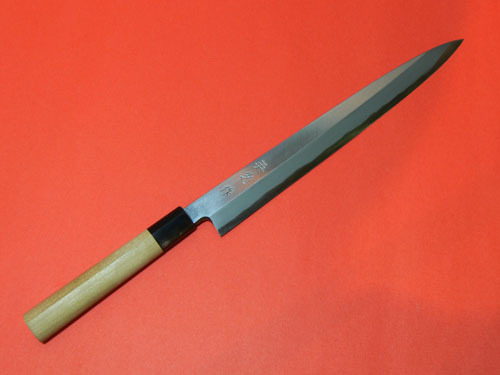 This knife is called Kiritsuke knife which is used for slicing sashimi, peeling vegetables, and cutting most of ingredients for all around with only this one. 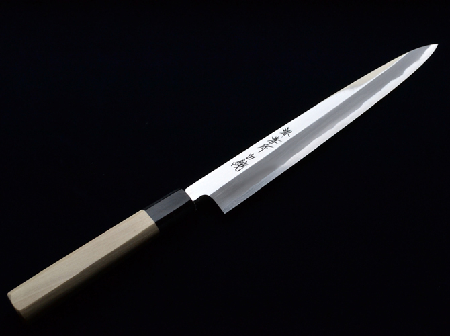 The blade is made out of Yasuki Shiro II ko(white II steel) which is very suitable for Japanese chef knives. It is very hard steel and hold on the edge very hard, and very little impurities in the steel. HANDLE; Magnolia with Water Buffalo horn bolster. 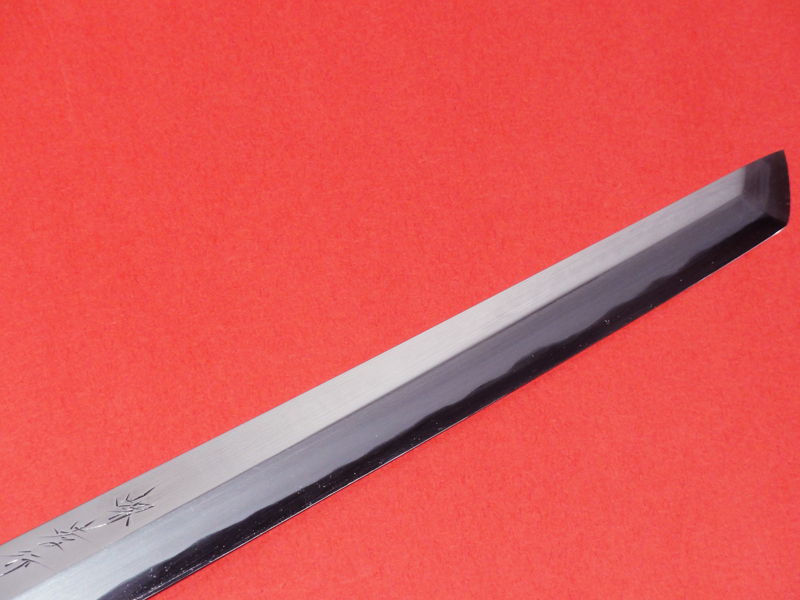 BLADE; Hongasumi style blade which is harder steel blade on the blade of the edge and softer steel on the body of the blade. Those different steel combinations make easier to sharpen knife and the knife stronger, and make it easier on the processes of knife making. 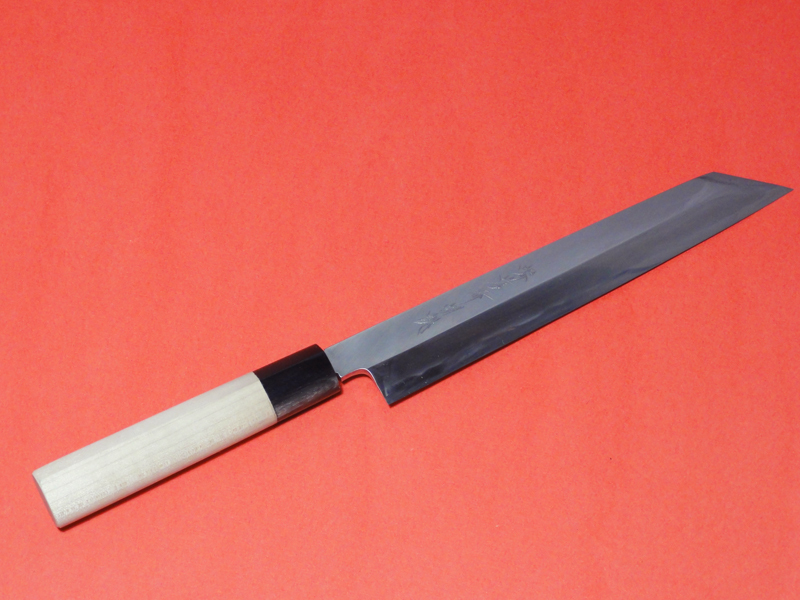 The Yanagi is a traditional Japanese knife used to cut boneless fish fillets. It is mainly used for a drawing cut, where the heel of the knife is placed on the fish and a cut is obtained by lightly pressing down or letting the weight of the knife do the work while drawing the blade towards you. 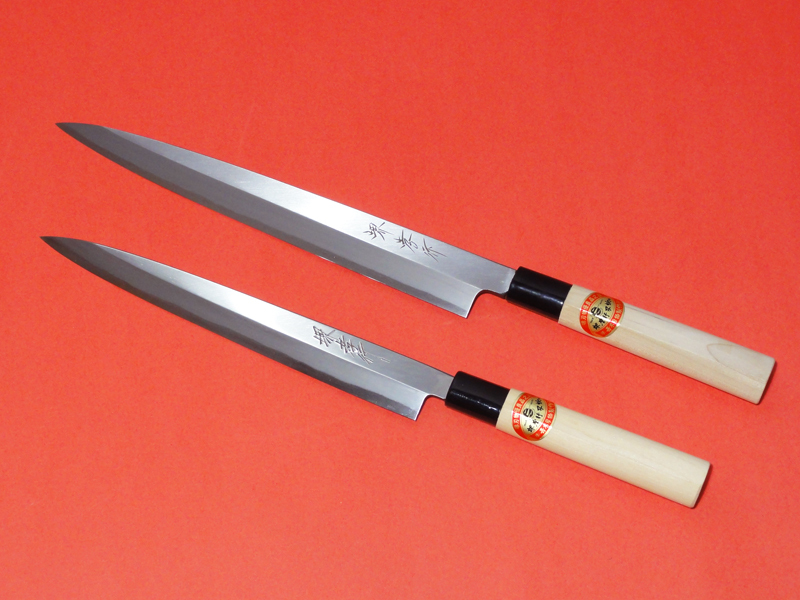 (Sashimi knife) It’s acute-angled edge making it unsuitable for cutting hard objects like bones and frozen food. The knife surface, made of white – 2 steel, is polished to a mirror finish to prevent rust and stains on the blade. You cannot find Yanagida for left handed people in Canada, but we have and sell them. They are made by white steel and quality is so incredible. They are shining all the time.